Engineering Safety Consultants (ESC) Ltd is pleased to announce that it has recently successfully completed its third Achilles UVDB Verify Audit process. In its third annual audit, ESC increased its average score from 97% to 98% across the four key audit metrics evaluated by Achilles’ assessors. 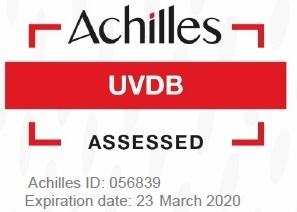 Completion of an Achilles UVDB Verify assessment is a key requirement of suppliers who need to demonstrate their capability for contracts with a high emphasis on Safety, Health, Environment and Quality (SHEQ). The category in which ESC was successfully audited is Verify Category C: an assessment tailored specifically for consultancy and /or design service providers that provide their services on operational sites/or working on behalf of a utility with more than £1 million turnover and 10 employees or sub-contractors.